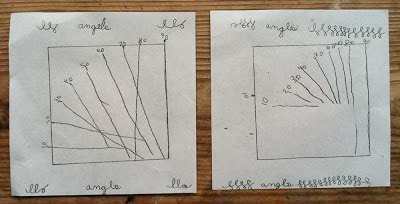 Making a "Map of Angles"
Sometimes I think the best learning is the least expected kind. Or maybe it's the kind where you take advantage of the moment. Like this morning. 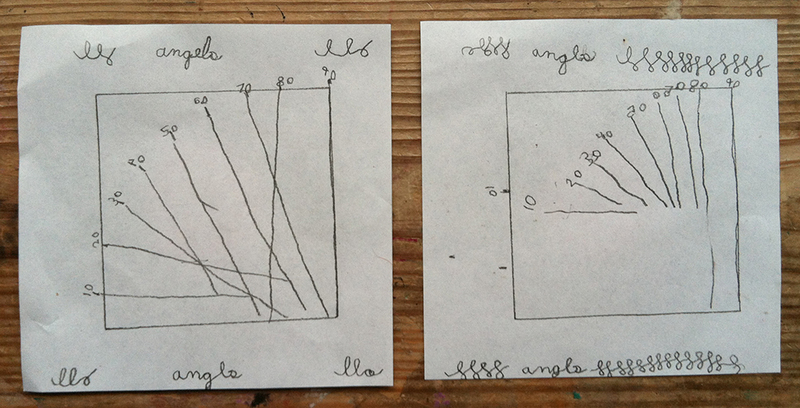 Seven year old: "Hey Mama, I'm making a map of angles!" Me: "How do you do that?" "You know, with the plastic map of angles." "Yeah. Wanna buy this one for a penny?" "Hmmm...let me think about that. I think its worth between a penny and a dime." "You got yourself a deal!" "Hey, I know! I could make a bunch of angle maps and you could buy them." "Well, you could use them at your family night." "Hmmm...sounds like a good idea. I guess it would work if you could make each map different in some way." "Oh, I know! I'll use this square [template]." First she marked the angles, and drew the lines free hand. Then I happened to wander by and casually showed her how to draw the rays from a center point. "How 'bout I color it?" "How much will you give me for them?" "Oh, I don't know, how about a quarter each. You're putting some good effort into them, I think they're worth it." "I've got two sheets left. How can I do them differently?" "How about trying it with a circle. But how would you find the center point? [Both of us experimenting...] If you make a circle with your compass you'll for sure know where the center is...."
And there you have the story of the "Map of Angles". We still haven't figured out how exactly I'll use them at the family night. 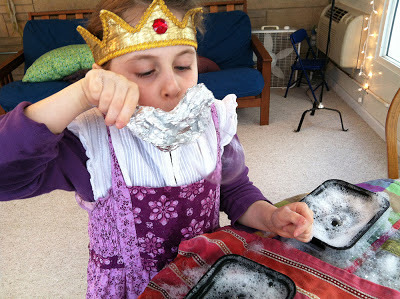 Also, I don't normally pay my daughter for school work! But the combination of earning potential and being part of the family night in some way even though its too late and too far away for her attend was obviously a very inspiring and motivating context for her! I can't really imagine this would be an interesting activity all on its own, but the results sure are pretty! Look How Our Number Wall Grows! 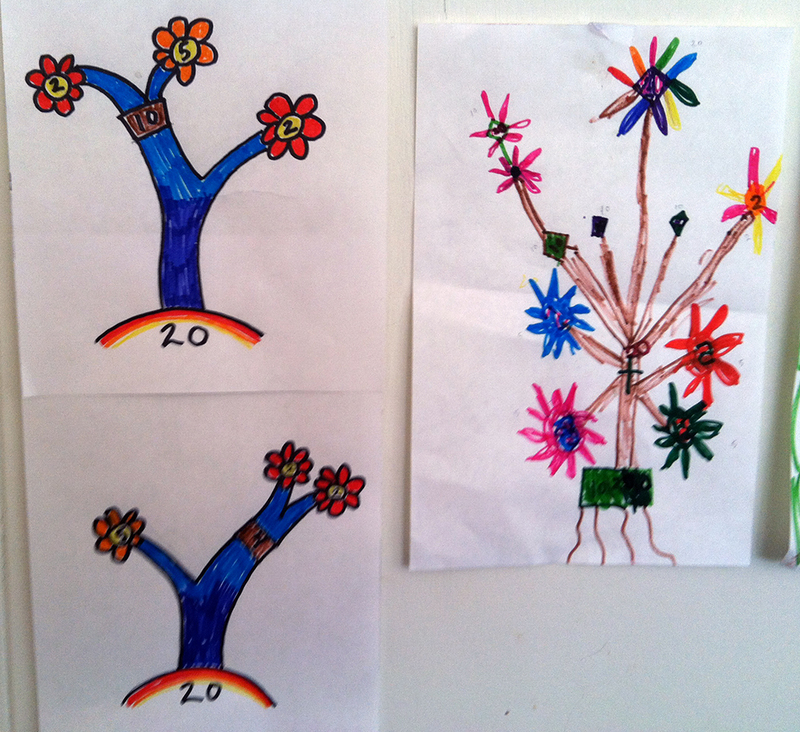 As a little update to my recent Seeing Numbers post, I wanted to show you what an effect these re-imagined factor trees are having on my child. The next day she chose 40. 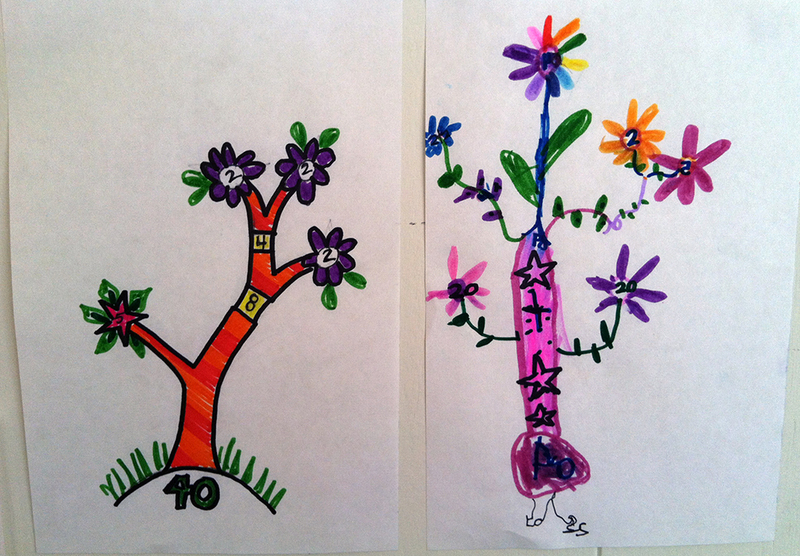 As before, this tree utilized addition and multiplication as she built its branches. 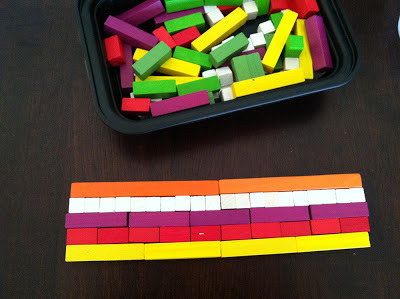 We also noticed, when we made the preliminary wall of factors with our Cuisenaire rods, that we used the same color rods as when we factored 20, just twice as many. 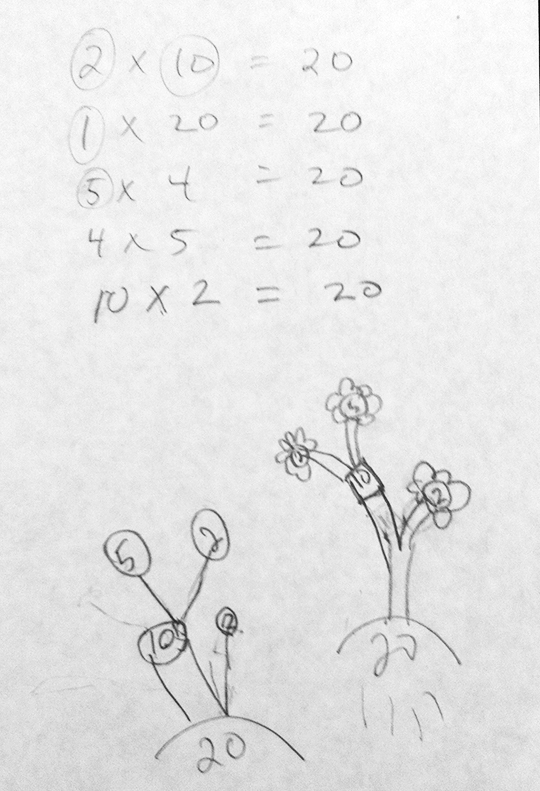 I had other math things planned for today but this morning she asked, "Can we make another number tree?" Yes, of course! We settled on 30 and this is when her understanding of what we were doing really took a jump. After we created wall of C. rods and after I sketched out all the different factor trees for 30 (like I did both times before) she, unbidden, picked which version she wanted to make. Huge. Both times prior to today I walked her through the structure of my own tree (more in line with factoring) but did not define what exactly a number tree should be. 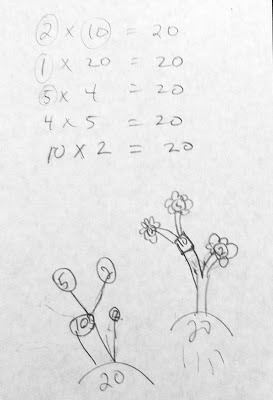 As long as she was composing or decomposing numbers somehow on her tree I was set to be happy which is why I was surprised that she moved over to the factoring camp so quickly. 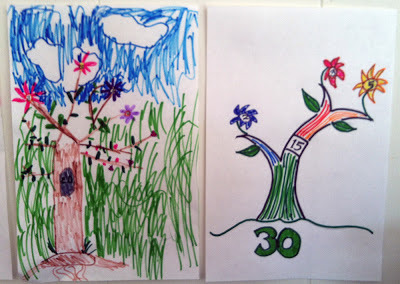 In her 30 tree her artistic vision is grand but her numbers are tiny, lol! 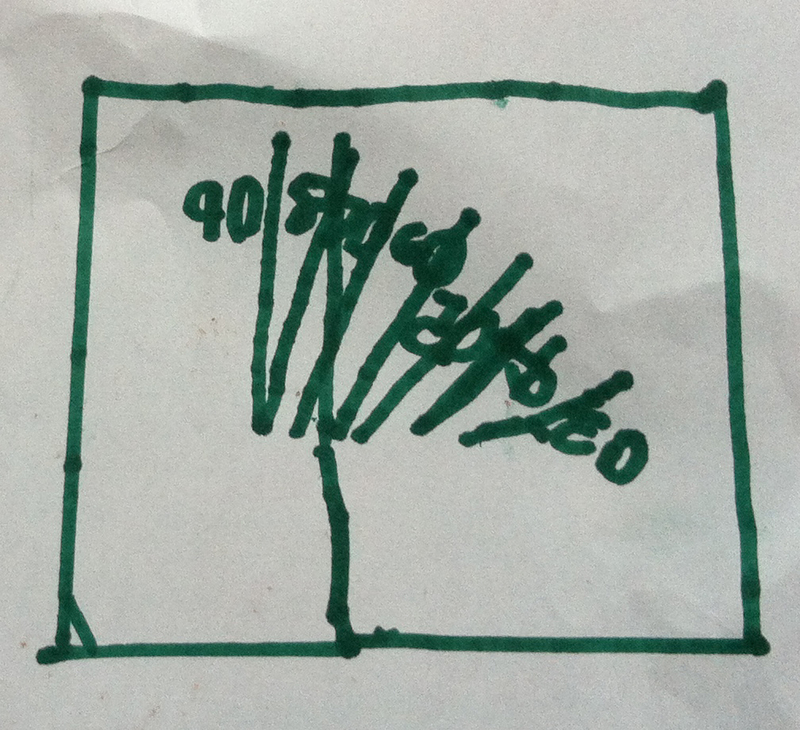 As we looked at her tree closely she showed me the first level of 5 and 6 branches, and then the additional 2 and 3 branches off the 6. And, as with the other two trees, she added a crowning flower showing the day's number. These pictures are all on the wall next to our dining table. She has been admiring them and examining them closely every time she sits down to a meal at which time we also admire each others handiwork. I have invested in some new markers and paper because I never want this to end! I will be forever grateful to Simon Gregg and his 5th grade students at Toulouse International School for providing us with such a perfect vehicle for exploring numbers in a way that makes sense to us. I had been looking for a way to look at and explore numbers that involved an expressive visual element and am excited to see where this will take us. We've grown so much already through the process of observing and using the commutative property with the C. rods, applying understanding of groupings to our design, and conceptualizing division in a completely different, very exciting way. I've been thinking on and off about ways to help my seven year old daughter come to know, appreciate, and maybe even love numbers. Geometry is easy for both of us because it's visual. 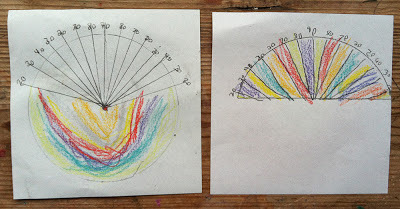 But because my math schooling was of the memorize and drill variety I have really had to stretch myself in order to make my daughter's early experiences with numbers more meaningful than mine were. As it turns out, I'm learning a lot in the process and, as a bonus, I am finding that numbers are quickly becoming an unexpected but welcome gang of amusing little friends. 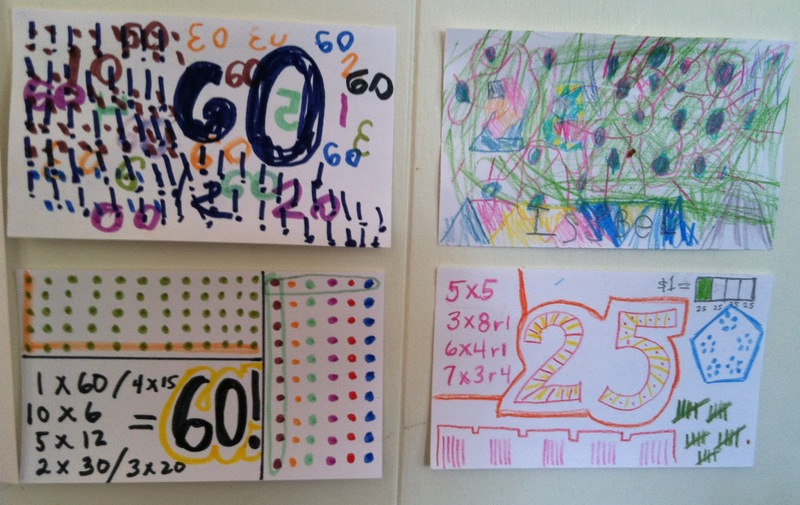 Since we're working on conceptualizing multiplication and division these days through various explorations, I thought it might be fun to make 'number cards' to visualize one number at a time. Using coins (and clarifying their intent as reconciled in my recent post on units: When is a 10 Not a 10?) we looked at all the different ways to split 25 and found lots of remainders. I suggested 60 after we read that base 60 was popular early on because it can be divided in so many ways. 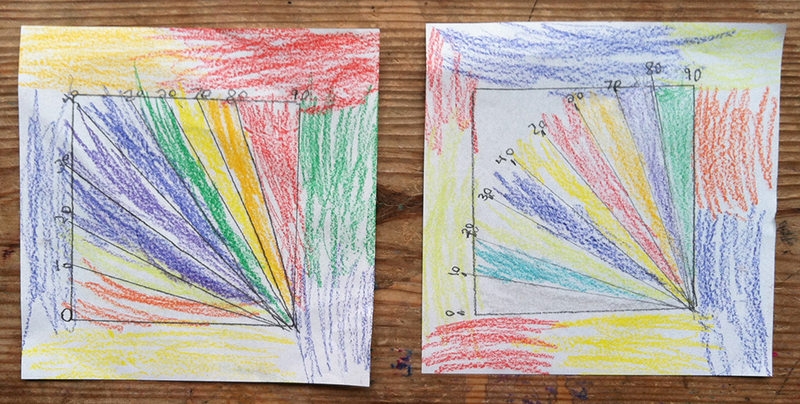 As you can see, the results are less than inspiring and it's not clear to me that the child really learned anything more from making the cards in addition to the array work with the coins. I showed the girl the post that inspired me and she was entranced and eager to get started. 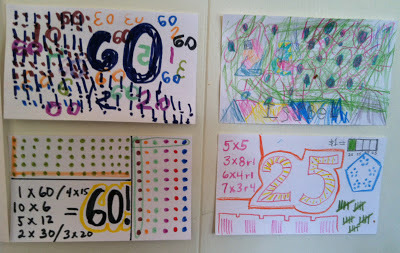 She is doing well with hands-on and mental multiplication and division, but factoring as an activity is new to both of us and so I decided 20 would be a nice easy number to start with. We took out the Cuisenaire rods and she found all the factors of 20 herself. She double checked every rod from 1 to 10 and noticed a lot during the process, skip counting as she went. "If I can use fours, I can use twos, too!" "Threes...no that makes twenty one...."
To me, it's glorious. 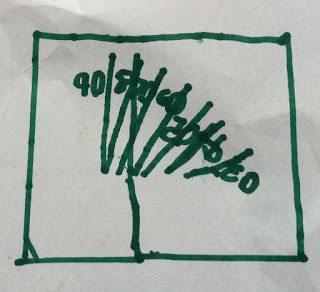 Even though it's not a factor tree, per se, it shows so much of how her 7 year old self is thinking about numbers, including an emerging understanding of factors. All the numbers she wrote are obscured by the coloring, so I had to ask her about them. At its base are the numbers 10, 10 and 20. Notice the overall symmetry of the tree. 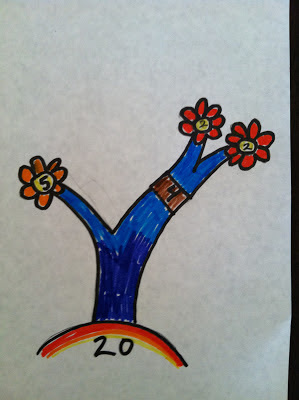 The flowers at the base are 5+5+5+5 (do you see the 'plus' sign written on the trunk?) and, even better, the colors are inverted in each pair. Moving up the tree, the next two longer branches on the outside are 2 and 10 (so 10x2) and the two small branches inside them are both 10 (so 10+10) and the crowning flower is 20! 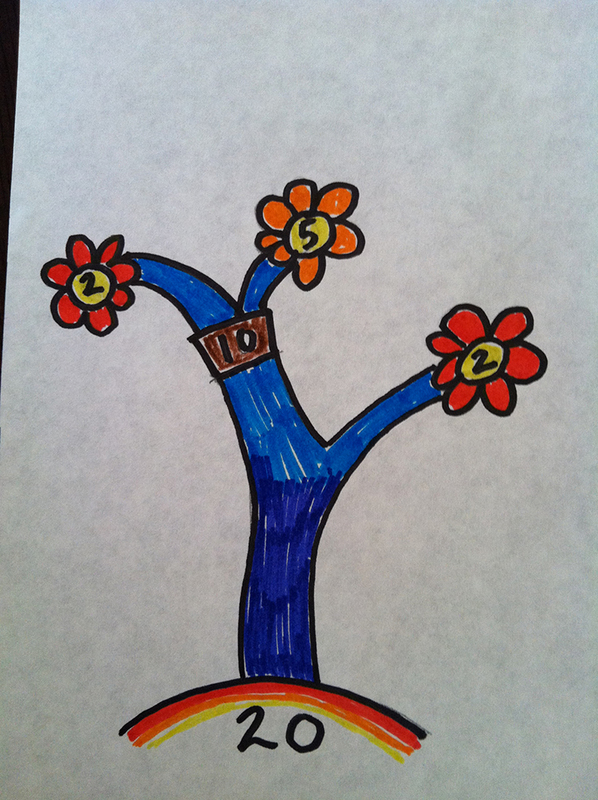 This tree motif is doing so much more for her visualization of numbers than those little cards ever could!! I'm so excited. 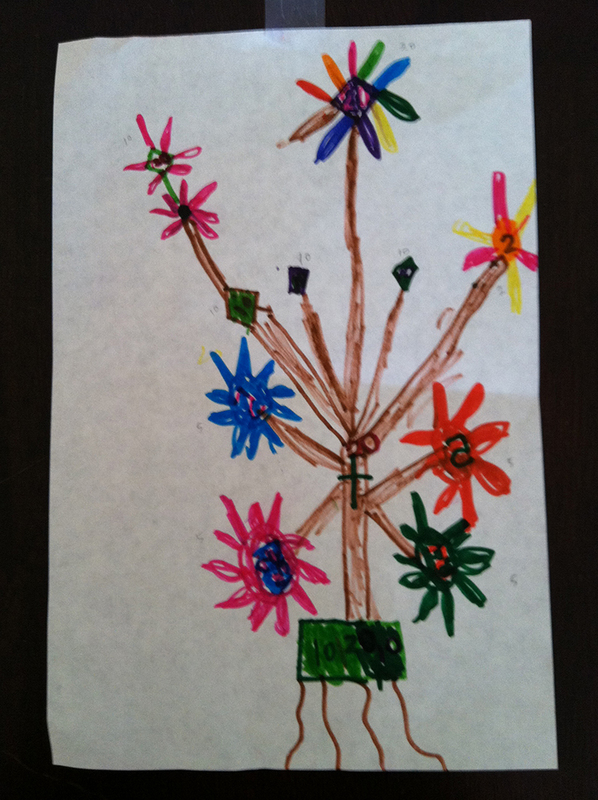 And, as a little bridge to future trees, after she walked me through her drawing I showed her mine. 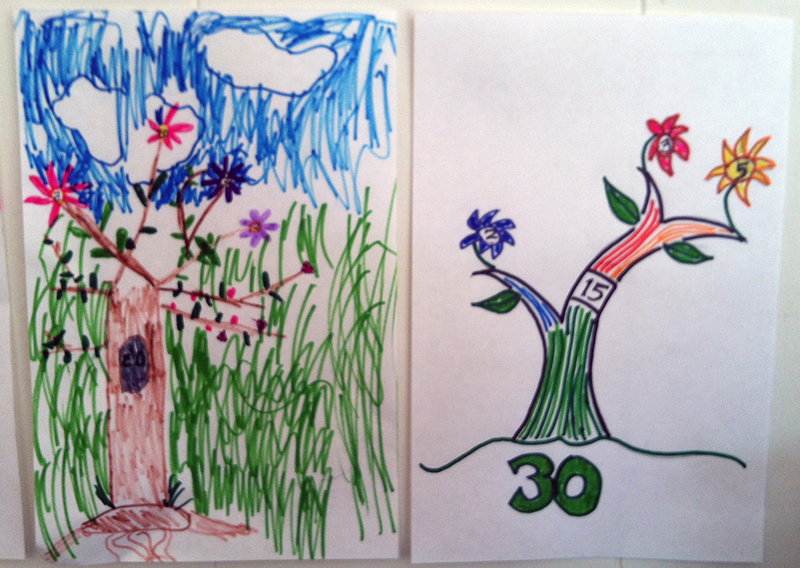 I asked her what she noticed and what the differences were between the trees. There is no need for us to rush into full-out factoring, but it is an interesting exploration and variation on the division we've been doing. And, the introduction of another type of number, the primes, is an interesting development as well. I think this is an approach that we will be able to use time and time again: create, observe, discuss, posit, repeat. Let's see: trees as metaphor. I've seen fractal trees, factor trees, and trees whose branches are the positive numbers and roots the negative ones. 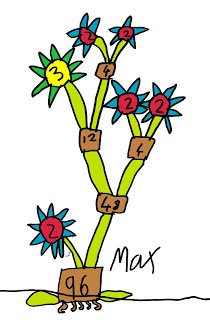 There is so much potential in this kind of image/metaphor for number explorations through all elementary grades. And, you do know that part of this approach is giving kids an empty piece of paper, some awesome pens and letting them create their own trees from the ground up, right? 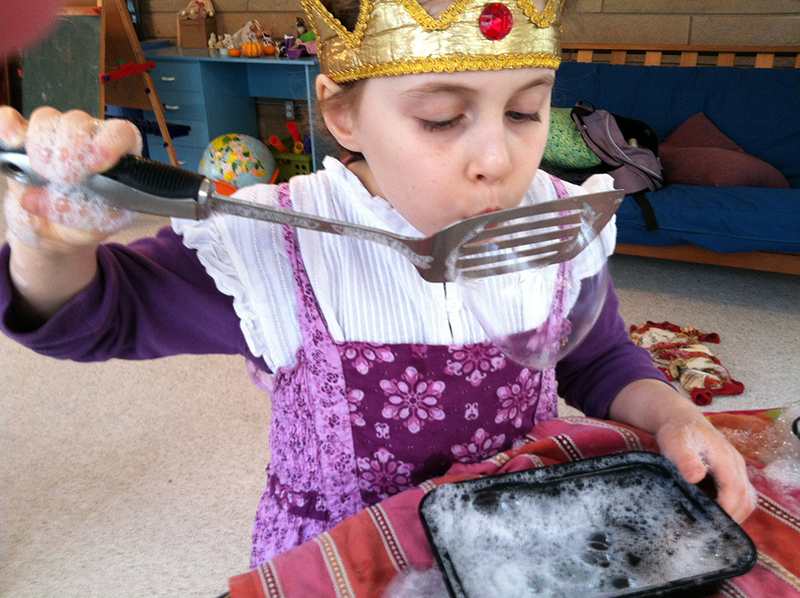 First, there was the day of "bubble technology" experimentation. 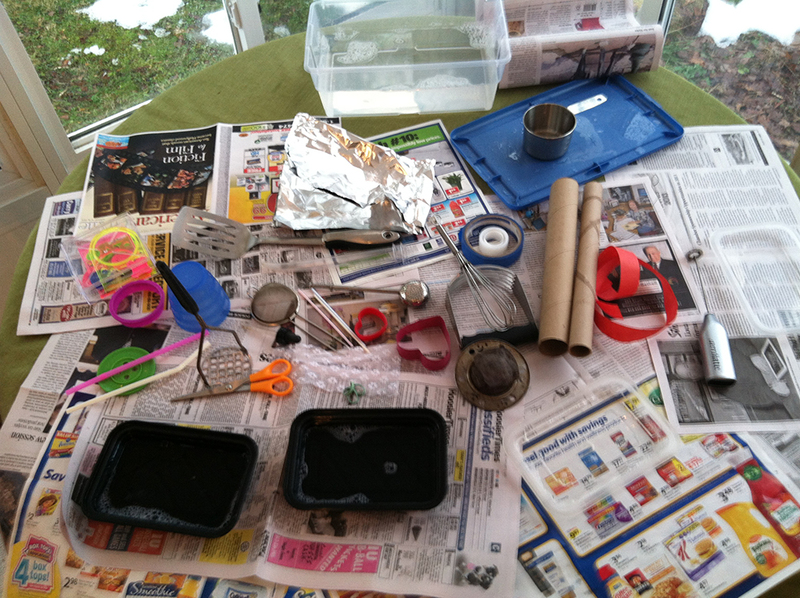 Out of the assembled household items which ones made bubbles? Which of the bubble makers made big bubbles and which made small ones? 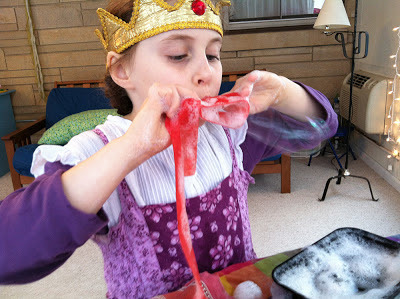 What did all the bubble makers have in common? Then a chance to invent your own bubble maker. This one is a tea ball/straw combo that actually made bigger bubbles than just the tea ball alone. Then, there was the chapter in The Adventures of Penrose the Mathematical Cat where we learned more about the mathematics of bubbles including the new concept of "triple junction". 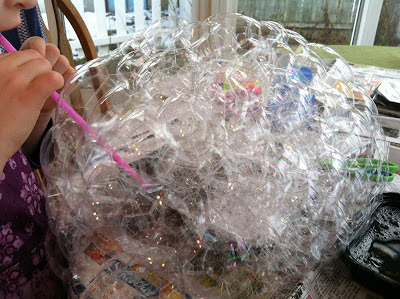 That's what is created when bubbles come together in a cluster to create three 120 degree angles. The bubbles tell Penrose: "Regular hexagons fit together perfectly leaving no gaps. They tessellate a plane. The same idea is true of bubble clusters but in 3-dimensional form." Which then becomes a perfect review of the regular tessellations we experimented with a few weeks prior. And, later in the day, at least three examples of triple junctions were found spontaneously by the child: on a soccer ball, in the petal formation of a snow drop, and in the back-view of old-fashioned suspenders. Oh 'three-ness' how I love you! My goodness, math is everywhere and the child now no longer needs to be prompted to make connections. Thanks to a good six months of her first grade year devoted to Sidewalk Math, as a second grader she can now find examples of a new math concept in multiple environments all on her own. I love that! Learner Dancer Teacher "Math Explorer"
It's been a year since I read Contance Kamii's Young Children Continue to Reinvent Arithmetic, Implications of Piaget's Theory. I'd probably understand it better now, what with first and second grade math under my belt. Well, my daughter's math anyhow. I was just reminded of Kamii's work (and how much I want to re-read it) when I opened another gem today: Young Mathematicians at Work: Construction of Multiplication and Division by Catherine Twomey Fosnot and Maarten Dolk. I got wind of this book via a math education reading list constructed (ha!) by three educators-of-math-educators I know of via Twitter: David Wees, Christopher Danielson and John Golden. "Like all human beings, mathematicians find ways to make sense of their reality. They set up relationships, they quantify them, and they prove them to others. For teachers to engage children in this process, they must understand and appreciate the nature of mathematics themselves. They must be willing to investigate and inquire -- and to derive enjoyment from doing so. The book you hold is primarily about that -- how teachers and children come to see their own lived world mathematically, their journey as they pursue the hard work of constructing big ideas, strategies and mathematical models in the collaborative community of the classroom." I love this and I can't wait to dig into the book. I think the reason I'm so excited about it is that I've always been interested in how people come to learn and know things but I didn't have an outlet for this passion until fairly late. When I was very young I wanted to be a teacher. As I grew older I thought, "I can't possibly be a teacher -- there is nothing I know and love well enough to teach." And so I spent many years trying to do other things. Then I found percussive dance. I was 26 and a half years old. A year or two in I realized, not only was I pretty good at dancing but I was also able to break down steps in multiple ways for various types of learners in a way that was useful to them. And now, 'x' years later? Who am I? I'm someone who has built a bridge to the math for students who might not otherwise ever glimpse the other side, but I'm not sure I'm a math teacher yet. I think the best description of who I am and what I'm doing is the one Maria Droujkova gave me when she welcomed me to the Moebius Noodles team last week as "the creator of the Math In Your Feet program and a math explorer...."
Now that is a title I can wholeheartedly adopt. I don't know if I'll ever be able to call myself a math teacher or if that is really my purpose in the midst of all this wonderful, beautiful, gorgeous math that I'm finding. On the other hand, Fosnot and Dolk say that (math) teachers "must be willing to investigate and inquire -- and to derive enjoyment from doing so." I think that is a pretty apt description of what I am doing as I bring math to young people, through percussive dance or other making-math ventures. Over the last year or so I've found plenty of opportunities to listen in on the conversations happening between a wonderful group of math educators via blogs and Twitter. They're often talking about my favorite topics: thinking, learning, teaching and...math (and all possible meanings of that word). This kind of conversation, about the facilitation of actual learning, feeds my intellectual heart and brain. It also ignites my enthusiasm for the elementary math that I never really learned the first time around. It's the best possible remediation: using my adult brain and my lifetime of experiences to explore math on my own terms and interests....and then figure out how to best facilitate the learning of others. A gorgeous example of mathematical art. And a more in depth article from the Smithsonian on his process. 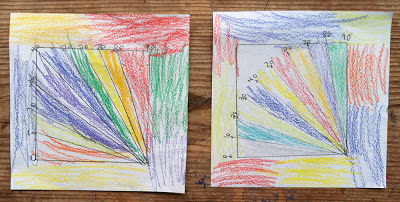 "I was interested in the art and he was interested in the mathematics and we started exploring both together using the art as a visual idea for understanding many of the problems we were studying in mathematics. And before we knew it I became hooked on the mathematics and he became hooked on the art and our goal today is to try and combine them so that they're kind of indistinguishable. So you can't tell whether we're doing art or math but they're both there together." That's what I'm trying to do in Math in Your Feet. If you're interested, here is a video that I made recently describing how I combined percussive dance and elementary mathematics into the same learning and creating process.